The skill to manage personal finances is something everyone should learn. Being knowledgeable in handling money is not just a privilege but something every person should know, considering how inevitable it is to deal with financial decisions in everyday life. Fortunately, you can get a useful finance calculator software easily. This software makes it easy to plan, calculate, and manage costs without the need for any formal training on financial management. Financial position is the evaluation of one’s personal resources. It is associated with the net worth and cash flow of an individual or his household. Net worth is determined as the net value of a person’s assets minus the liabilities or debts. Cash flow, on the other hand, is the accounting of money earned and spent. It is a way of tracking income sources and expenses incurred. Adequate protection refers to the process of planning finances to protect a household from financial uncertainties. This takes into account the accounting of credit, properties, insurance plans, and planning for long-term care. You have to know how to choose the right credit options in case you are in an urgent need for cash. As such, it is important to know how to calculate true interest rates and overall costs of borrowing to be able to pick the best option when you need to borrow money. Likewise, you have to learn how to compare insurance plans to know which is more cost effective. Retirement planning, obviously, refers to preparing for retirement—when you need to carefully examine your pension or retirement fund options. How much should you put up? When should you start saving? What kind of retirement fund should you create? Your knowledge in personal finance can help you do the calculations to make a good choice in this regard. Estate planning, another crucial area, is also one important topic in personal finance that requires some good sense of planning and evaluation. While it may be more of a matter of doing allocations, there are still financial calculations involved. As mentioned, almost every area of focus in personal finance involves numbers. Things need to be quantified in order to come up with more sensible financial decisions. Without looking at numbers, it’s almost impossible to properly pinpoint the right decisions like choosing which insurance policy offers the better deal or which loan should obtained (the one with the lower interest and charges). You can do “guesstimates” as you look for insurance plans or personal loans but it is always better to have some degree of near-accuracy in terms of numbers. In tracking household cash flow, for instance, you can’t just look at what you have and what you have been spending away by ending balances. You need to monitor how the cash flows in and how it flows out. A good finance calculator is one that covers as many of the personal finance areas of focus described above. However, you can hardly find one software suite that covers all aspects of personal finance comprehensively. 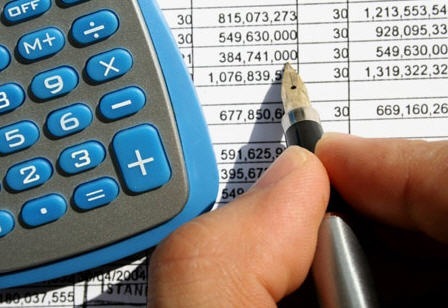 Most of the time, it is more convenient to use different financial calculator tools to deal with different matters. Fortunately, there are several of these sets of tools readily available online. The following are some good examples. They are offered by some of the most reliable names in the field of personal finance. Investopedia’s Calculators are great tools for computing various personal finance and investment related figures, including present and future values, annual effective interest rates, periods to grow sums of money, tax brackets, and mortgage payments. The Online Financial Calculators of TCalc includes various personal finance calculators that include tools for computing college savings, debt consolidation, loan affordability, and credit card payoff. Additionally, there’s also Bloomberg’s Personal Finance Calculators that make it easy to compute mortgage numbers, plan your retirement, and come up with estimates on potential savings. If you’re good with numbers, you may not really need a calculator software of sorts to plan and track your finances. However, for most, a calculating tool provides significant help as it provides guidance and simplifies the whole process of evaluating decisions when it comes to personal finance.